The paint stratigraphy of the two clock faces from the tower clock of the Government Palace in Helsinki (Finland) was analysed in order to determine their original colour before restoration works. Paint cross-section samples from both clock faces were analysed by confocal Raman microscopy and scanning electron microscopy coupled to an energy dispersive X-ray spectrometer (SEM–EDS). The results revealed the complex superimposition of paint layers applied over the original black colour. FTIR/ATR analyses proved that the original paint was prepared with linseed oil-resin media. Most likely not all of the different layer colours were visible. Some of the layers were likely to have been a primer or for rust protection. There are a wide variety of techniques available for the analysis of items of cultural heritage. However, the use of traditional techniques to investigate valuable artworks is sometimes impossible, since profuse sampling procedures are forbidden. Fortunately, in recent years, non-destructive/non-invasive techniques such as diffuse reflectance infrared spectroscopy, Raman spectroscopy, X-ray fluorescence spectroscopy and scanning electron microscopy have been demonstrated to be important techniques for the characterisation of cultural heritage samples, establishing new analytical protocols . The versatility and adaptability of portable/hand-held Raman spectrometers have been demonstrated by studies carried out on rock paintings in caves and rock-shelters [2–4], mural paintings , plasterworks  or valuable collections in museums . Together with portable Raman spectroscopy, portable/hand-held energy dispersive X-ray fluorescence spectroscopy (EDXRF) has become a very valuable technique in the field of cultural heritage, for example, in the studies of pottery , cave art , bronzes , wall paintings , etc. Whenever cultural heritage samples are to be analysed, non-destructive mobile instrumentation provides a unique opportunity to collect in situ data and ensure the integrity of the artwork. Nowadays it is possible to say that the results obtained by in situ analysis are of the same quality as those obtained by laboratory instruments [12, 13]. Unfortunately, even though the in situ approach often supplies enough information about the nature and state of preservation of the artwork , the obtained data comes only from the surface of the studied object. Therefore, if the composition of individual layer of a multi-layered sample is required, e.g., paint chip, then, destructive sampling techniques is required . This provides an opportunity to obtain information regarding the raw materials used in the original artwork . In these instances the combination of Raman microscopy and scanning electron microscopy coupled with an energy dispersive X-ray spectrometer (SEM–EDS) can be a powerful combination. Recent research using this methodology in the cultural heritage field includes the determination of Sibyks , rock art [18, 19], bronzes  and miniatures . The sample can be explored more extensively, as the combined techniques provide information about the distribution of either an element (SEM–EDS) or a compound (Raman spectroscopy) along the paint cross-sections. In addition, chemical imaging on polished paint cross-sections is an effective technique capable of visually displaying the distribution of numerous chemical components in a sample [22, 23]. For instance, the different layers of a painting can be identified and characterised . These techniques are not sample consuming techniques and allow the opportunity for further analysis to be undertaken with other techniques. 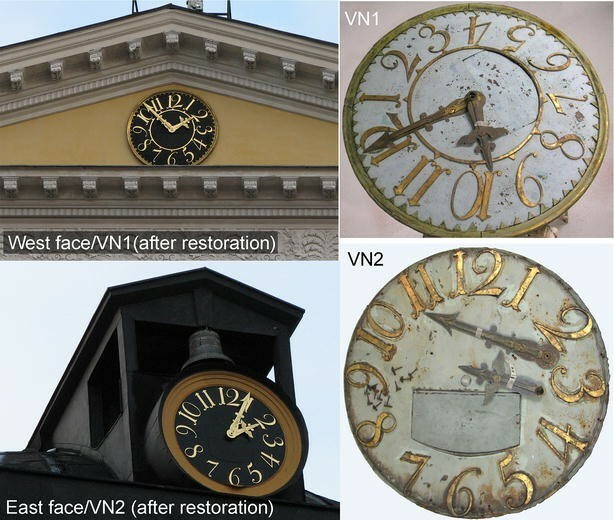 The aim of this research was is the identification of the pigments present in the clock faces of the Parliament Palace clock tower in Helsinki to aid in its restoration. The environmental conditions in Finland are very demanding in the vicinity of the Senate Square and near the coast. The paint on the clock face layers was cracking and flaking and were too loose and deteriorated to be preserved. It was important to determine the original colour of the clock face for restoration purposes. Gaining knowledge about the other paint layers, provided a history of pigments used in Finland after 1822. In the 19 and 20th centuries a wide range of new industrial pigments replaced traditional pigments used in Europe. However, there are only few case studies about the use of these new pigments in 19th century buildings in Finland . The analytical procedure was divided in two steps after thorough documentation of both clock faces. Preliminary elemental analysis of the paint layers were carried out using hand-held energy dispersive X-ray fluorescence (EDXRF). This technique provided some immediate results and allowed in situ non-invasive testing. Microphotographs from paint layers cross-sections were also acquired. More detailed studies continued with confocal Raman microscopy and SEM–EDS. The samples from the clock faces were analysed as paint cross-sections in order to identify restorations that had taken place during the lifetime of the clock, as well as to determine its original colour and pigments. In this paper the results obtained by the combination of SEM–EDS and Raman microscopy are shown. Additionally, the results obtained regarding the analysis of the binder of the original colour of the clock faces using FTIR/ATR spectroscopy are also included. The combined restoration and research of the tower clock of the Government Palace (originally the Senate) in Helsinki has been a remarkable cultural heritage project. The Government Palace is a typical Empire palace in Helsinki, where buildings around the Senate Square are internationally significant examples of the neoclassical style. Johan Albrecht Ehrenström (1762–1847), a native of Helsinki had drawn a square city plan for Helsinki with broad streets, and the German-born architect Carl Ludwig Engel (1778–1840) was responsible for these buildings designs. Some of Engel’s buildings have been demolished, but his most important creations around the Senate Square have been preserved. The three main buildings in the Senate Square are: The Senate, the University of Helsinki and the St. Nicholas’ Church, later called the Helsinki Cathedral. The first building to be completed was the Senate in 1822, now the Palace of the Council of State also known as Government Palace [25–29]. The Government Palace clock tower (Fig. 1) is of Finnish origin and made by the most famous Finnish watchmaker Jacob Johaninpoika Ala-Könni (1774–1830). His two other tower clocks were in Hämeenlinna and Tammisaari, but the Government Palace clock is the only one that has survived in its original location and has been maintained as an active public clock . On the Senate Square side the clock face from which the authors use a documentation code name west clock face/VN1 is a painted copper plate. The numerals, minute marks, hands, inner frame and profiled outer frame are all made out of fire gilded brass. On the courtyard side the clock face with a code name east clock face/VN2 was initially made of wood and presumably tarred or painted in black. Later, it was replaced with a painted iron plate. The wooden face was found during restoration works under the iron face and it is still there after restoration. The outer frame of the east face was covered with a flat brass profile sometime before 1997. Kello ja Kulta Widemark (Ltd) has been responsible for the regular maintenance of the tower clock since 1919. Worn machinery parts have been replaced as needed over the decades, but the clock faces were never removed until 2010, when the second weight rope broke. This resulted in a restoration project of both clock faces, their frames and machinery. The surfaces of the clock faces were studied with a stereo microscope and paint flakes were removed with a scalpel during documentation. Three series of paint cross-sections were prepared from both clock-faces. 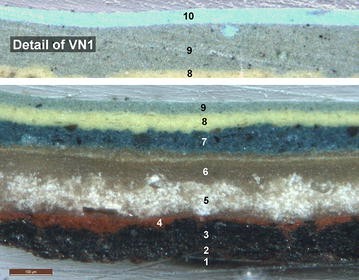 All series consisted of 14 samples from the west face/VN1 and 5 samples from the east face/VN2 paint layers. Paint flakes were embedded in a two component Terpol Oy Solution UN 1866 polyester resin ground, which contained 1–1.5 % Norpol Nr1 hardener and polished with silicon carbide paper (see Fig. 2). A Leica optical microscope (OM) with reflected light was used to examine the order and structure of the paint layers and the micrographs were taken with a Leica DFC 240 megapixel digital camera. After examination of the paint layers with OM a selection of cross sectioned samples were further analyses with Raman spectroscopy and SEM–EDS. An EVO 40 scanning electron microscope (Carl Zeiss NTS GmbH, Germany) coupled to an X-Max energy-dispersive X-Ray spectrometer (Oxford Instruments, UK) was used to acquire images and elemental composition. SEM images were acquired under a high vacuum employing an acceleration voltage of 20 kV. Magnifications up to 10,000× were obtained using a secondary Electron detector. EDS, was used for elemental mapping, and the analyses were performed using an 8.5 mm working distance, a 35° take-off angle and an acceleration voltage of 20 kV. To avoid charging effects the areas of interest were surrounded with carbon tape. SEM–EDS data collection used the INCA suite 4.13 (Microanalysis Suite, UK). This software allowed the simultaneous collection of chemical maps of all elements present within the sample. The plots appear in black and white, where the former represents the absence and the latter the presence. Raman analysis was performed using a Renishaw inVia confocal Raman spectrometer, coupled to a Leica DMLM microscope. The spectra were acquired with a Leica 50× N Plan (0.75 NA) objective. The spatial resolution for the 50× objectives is about 2 μm. For the focusing and searching of the points of interest, the microscope implements a motorised stage (XYZ). The system has two lasers, 514 nm (ion-argon laser) and 785 nm (diode laser). The 514 nm laser has a nominal power at the source of 50 mW, the maximum power at the sample of 20 mW. In the case of the 785 nm laser, the power at the source is 350 mW, the maximum power at the sample 150 mW. For all measurements, the laser power was reduced in order to avoid photo-decomposition of the samples (burning) by using neutral density filters. The best results were obtained with the 785 nm laser (data shown in the present paper). For each spectrum a minimum of 10 s exposure and 10 scans were accumulated in the spectral window from 100 cm−1 (cut-off) to 3200 cm−1. A baseline correction was applied to all Raman spectra due to the high fluorescence. The interpretation of Raman results was accomplished by comparison with standard Raman spectra from the e-Visart and e-Visarch databases [31–33] and spectra obtained from on-line databases . To investigate the binder of the original colour of the clock faces, the original black paint layer was separated from the other layers with a scalpel under the stereo microscope and the organic media of the black layers was extracted in acetone. After the acetone evaporated, the remaining solid organic media was studied using a Perkin Elmer Spectrum100 FTIR/ATR instrument with Dyna scan interferometer, CsI beam splitter/optics and DTGS detector. A small amount of media sample was placed on the ZnSe/diamond crystal. The spectra were collected from 4000 to 530 cm−1 with 4 cm−1 resolution and the results were processed with spectrum for Windows Software by Perkin Elmer. The SEM–EDS analysis revealed the numerous layers of materials used in several restoration works. Figure 3 shows the chemical maps for the sample of west face/VN1. Table 1 summarises the SEM–EDS and Raman spectroscopic results obtained for both clock faces. 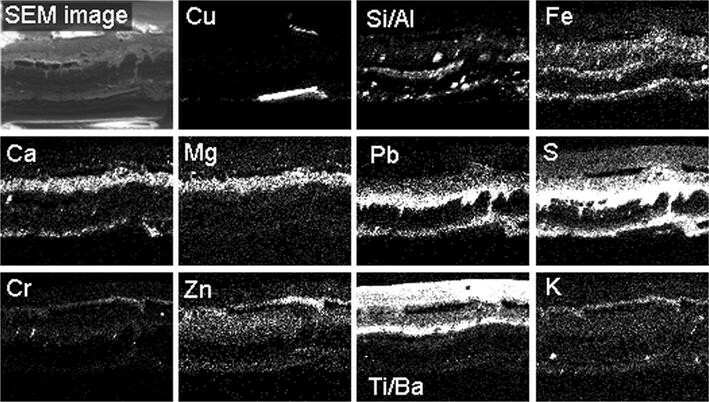 The SEM–EDS analysis revealed that it is possible to distinguish several superimposed layers of pigments and preparation layers in the clock west face/VN1sample (Fig. 3). From bottom to top, it is possible to see the copper support plate (see Figs. 2, layer 1, 3) over which a thin reddish layer composed mainly of Fe and Ca proposed to be from a preparation layer (see Figs. 2, layer 2, 3). The following layer is a thick black layer (Fig. 2, layer 3) composed of C (not shown). According to an archival photo information the original colour of the clock face was in fact black, thus, this layer would be the original colour [35, 36]. In an old colored post card from 1925 titled “Helsinki. Valtioneuvoston linna. Helsingfors. Statsrådets borg”, which was printed in the printing house “KK Oy”, the colour of the west side clock face was still black. On top of the original black layer there is a red thin preparation layer composed of Al, Si and Fe (see Figs. 2, layer 4, 3). However, the clock faces never were red, and it seems that a white layer was painted over it, which should be the next layer (see Fig. 2, layer 5, 3) composed by Ti, Ba, Pb and S.
As can be observed in Fig. 3, there are layers (see also Fig. 2, layers 6, 7, 8 and 9) of different elemental composition; grey-brownish (Ti and Ba mainly, together with S, Pb, Fe and Cr), blue (Ca, Mg and Fe), yellow (characterized by the presence of Cr, K and Zn) and white (characterized by the presence of Ti, Ba and S). The optical image in Fig. 2 (layer 10) shows a thin blue layer on top of the white layer. Under the SEM–EDS, the white and the light blue layers cannot be distinguished because they have the same elemental composition (Ti, Ba and S). However, a thin layer of Cu can be seen in Fig. 3, and it could be a key element to stablish which pigment is present in that layer (see below). As the elemental information obtained by SEM–EDS can only provided a clue about the pigments used in each layer, Raman analysis was carried out to identify the molecular structure of each layer. Fluorescence made data collection and interpretation difficult for some layers. However, it was possible to determine the presence of carbon black in the original black layer (amorphous C, broad Raman bands located at 1345 and 1585 cm−1 , Fig. 4a). It was possible to determine the presence of red iron oxide (Fe2O3, hematite, 224 and 290 cm−1, see Fig. 4b) in the red areas, together with some grains of red lead (Pb3O4, minium, 123, 150, 313, 390 and 548 cm−1 , see Fig. 4b). Over the red layer lead white (2PbCO3·Pb(OH)2, 1050 cm−1 ) was found. Unfortunately, the fluorescence was very high in the following grey-brownish layer, and poor Raman signal was recorded. The layer was a complex mixture of many pigments identified as well in other layers of the cross-sections (see below), such as Prussian blue, phthalocyanine blue, titanium white and carbon black. Prussian blue (Fe4[Fe(CN)6]3, 274, 532, 2089, 2117 and 2153 cm−1 , see Fig. 5a) mixed with phthalocyanine blue (C32H16N8Cu, 745 and 1526 cm−1 , see Fig. 5a) was found in blue areas. This finding means that this layer cannot be older than the mid-1930s, since phthalocyanine blue was accidentally discovered in 1928 and commercially available in 1935–1936 . In some spectra collected from the blue areas, titanium white was also found (TiO2, 446 and 609 cm−1 ). In the yellow layer zinc chromate (ZnCrO4, 342, 871, 891 and 940 cm−1 , see Fig. 5b) was detected together with barium sulphate (BaSO4, 986 cm−1 , see Fig. 5b) and lead oxide (PbO, 142 cm−1 , see Fig. 5b). Layer 9, is a white layer composed of titanium white together with barium sulphate, on top of which there is a very thin light blue layer, found to be titanium white mixed with phthalocyanine blue (Fig. 5c). Thus, there is a tenth layer in the sample collected from the west face/VN1. The binder of the original black paint was linseed oil. Figure 6 presents the spectrum of the binder which is dominated by a large band assigned to a C = O stretching mode at 1704 cm−1 with a shoulder at 1740 cm−1. According to literature , the band at 1740 cm−1 is consistent with the presence of linseed oil, whereas the band at 1704 cm−1 belongs to a resin (from a varnish). Additional evidence for the presence of linseed oil is observed by the bands at 721, 1095, 1175 and 1245 cm−1, also assigned to linseed oil. The bands at 1379, 1459, 2856 and 2929 cm−1 are due to both, linseed oil and resin. Resins that have IR bands in similar positions as those shown in Fig. 6 are attributable to either dammar or mastic . If we take into account all the results, some discrepancies can be found. For example, while the presence of K in the yellow layers was determined by SEM–EDS, no Raman signal of any potassium containing pigment was found. This fact can be linked to the manufacture process of zinc chromate , where potassium chloride was usually used. According to the pigment compendium , during the synthesis of zinc chromate, zinc potassium chromate can be formed or potassium can be present as a by-product of the synthesis. In the same layer, there were small and scarce amounts of PbO grains identified by Raman spectroscopy, but lead was not found by SEM–EDS. The scarcity of PbO and the limit of detection (around thousand of mg kg−1 or higher values) could be two reasons why Pb was not detected in those areas using SEM–EDS. In the red layers Fe, Si and Al were detected by SEM–EDS. However, no Raman signal was obtained from any mineral containing Si or Al. Fluorescence of silicates is the main problems when silicates are analysed. The presence of these elements is proposed to be due to the use of any kind of natural red earth containing clay. Raman spectroscopy identified Prussian blue and phthalocyanine blue which were found together, but Cu, an element within phthalocyanine, was not detected in these blue areas by SEM–EDS, probably due to its low concentration. Ca and Mg were found in high concentration in the same blue layer, but no Raman signal from any compound containing Ca or Mg was detected. We cannot explain this phenomenon, spectral acquisition was carried out using very low laser powers in order to avoid photo-burning of the sample, reducing the overall signal intensity. Photo books and old postcards of the picture collection of the Helsinki City Museum [35, 36, 38–41], revealed the west clock face/VN1 appeared to originally be black and then dark blue during the Second World War. However, the oldest photos are not reliable, because they are in black and white and the first colour postcards were often hand painted afterwards and some photos were re-used several times. More reliable dates of the west clock face colours could be estimated with the use of colour photos linked to historical events such as the general strike in 1956 . At that time the west clock face/VN1 was no longer black or dark blue, but blue, greenish blue (a bit turquoise), which could be the layer under the yellow colour layer. According to archival photo information west clock face was never red, bright white or yellow. Therefore, these layers must have been used as preparation, primer or corrosion protection layers. In one Helsinki tourist book from 1975 the west clock face/VN1seems to be greenish-grey but in another book in the 1970′s it is light blue. From the records of the National Board of Antiquities the last painting occurred at the same time of the great renovation of the building in 1997. With regard to the east face/VN2, a similar distribution of elements and compounds was seen by SEM–EDS and Raman spectroscopy. However, some slightly differences were seen between both clocks. The metallic plate support (layer 1) was Fe, with traces of Cr, Pb and Cu, instead of a Cu plate. In the west clock face/VN1, over the copper plate there was a thin preparation layer composed by Fe and Ca (layer 2). This layer is very difficult to see in the SEM–EDS image of the east face because the Fe signal is hard to distinguish from the underlaying Fe from the metallic plate, and the signal of Ca is very weak. In samples from both clock faces, SEM revealed a thick black layer composed by C (layer 3), which would be the original colour (black). In the west face/VN1, painted over the original colour there was a red coloured preparation layer composed of Al, Si and Fe, which was also present in east face/VN2 but in this case the layer was much thinner (layer 4). In the clock west face/VN1, over this preparation layer there was a thick white layer (layer 5) and over this one, another thick grey layer (layer 6). In the east face/VN2 both layers were found with the same composition as in the west face. Over the grey layer, a blue one was found (layer 7). In the case of the east face/VN2 Fe was not found in the layer, whereas in the west face/VN1 the detected Fe belonged to Prussian blue according to Raman spectroscopic results. Over the blue layer, in the east face/VN2 it is possible to see the yellow layer (layer 8) found in the west face/VN1, composed of Cr, K and Zn, and the white layer (layer 9) composed mainly of Ti also present in the west face/VN1. In the west face/VN1, over this last white layer there was a very thin light blue layer that is absent in the east face/VN2. With regard to the Raman analysis of the clock east face/VN2, the same compounds found in the west face/VN1 (see above) were found. However, while in the west face Prussian blue and phthalocyanine blue were found mixed together, in the east face only phthalocyanine blue was observed (layer 7). In fact, under the SEM–EDS system, Fe coming from the Prussian blue was not found in the blue layer. It seems that to darken the hue, carbon black was used. This study is an example of how science and technology can be useful in the field of cultural heritage. Thanks to this work, it was possible to determine that the black layer was the original colour of the historical tower clock faces of the Government Palace of Helsinki. However, the analysis revealed more colour layers over the original one on both clock faces. It is highly likely not all of the different layer colours were visible as a final top coat. Some layers were probably a primer or for rust protection. Because there were found some differences in chemical compositions of the paint layers of the two clock faces, it is very probably that both clock faces were not always treated or repainted at the same time. Unfortunately, we do not have old archival photo information about east face/VN2sample, and the archival information about west face/VN1 is unreliable because the oldest photos are in black and white and postcards are coloured by hand. The only reliable available document of clock faces treatments contained information of the latest light blue layer on west face/VN1, painted in 1997. The results of this study were used by restores and curators to re-establish the original colour of the clock faces. KC: SEM–EDS, FTIR/ATR interpretation. UK: SEM–EDS, FTIR/ATR analysis and interpretation. SFOV: Raman analysis. MM: Raman analysis and interpretation of Raman data. JMM: Interpretation of Raman data. RL: Historical background and restoration works. Paint cross sections and OM. FTIR/ATR analysis. All authors read and approved the final manuscript. This work has been financially supported by project IT-742-13 for Consolidated Research Groups, funded by the Basque Country Government. The authors would like to thank researcher Veikko Ahoniemi (Finnish Horological Museum), director Ismo Tuovinen (Kello ja Kulta Widemark) and architect Kati Winterhalter (Okulus) for the background information of this case study. Authors thank Raman-LASPEA Laboratory from the SGIker (UPV/EHU, MICINN, GV/EJ, ERDF and ESF) of the University of the Basque Country and Alfredo Sarmiento for their collaboration in the analyses. This work has been financially supported by project IT-742-13 for Consolidated Research Groups, funded by the Basque Country Government. Helsinki’s senate square. http://finland.fi/life-society/helsinkis-senate-square/. Accessed 3 Mar 2016. Helsingin keskustan arkeologiset tutkimukset. http://www.nba.fi/helsinginarkeologiaa/keskusta_kohteet_1810.htm. Accessed 3 Mar 2016. Helsinki 200 years as capital. http://www.helsinki200.fi/en/helsinki-1812-2012/1812-helsinki-committee-reconstruction-appointed. Accessed 3 Mar 2016.